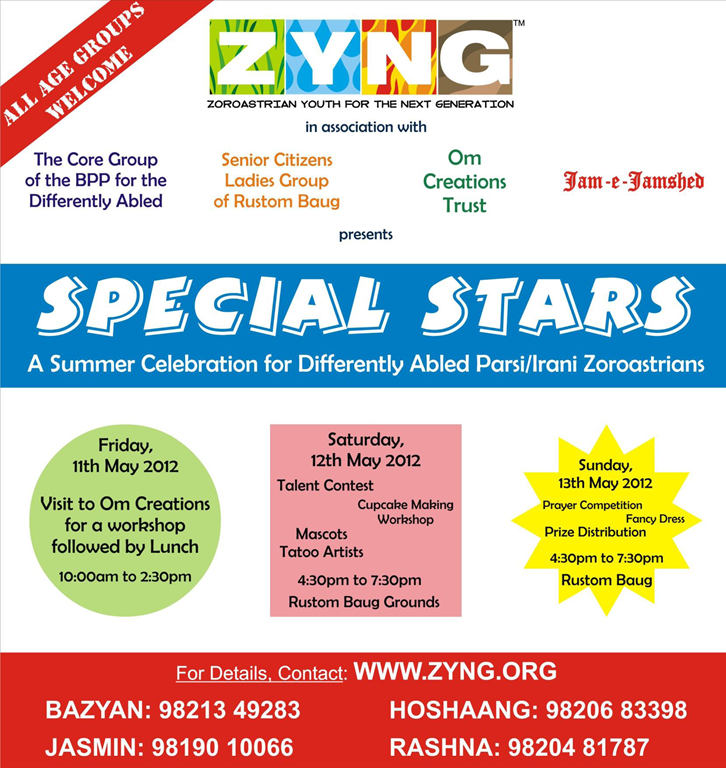 Participants: Differently Abled Parsi/Irani Zoroastrians are invited to come and spend the weekend with us. We will organize workshops and games for them and make them participate in various competitions (Talent / Prayer / Fancy Dress). All participants will be given prizes and goodie-bags. On Friday, 11th May 2012, all participants will assemble at 10:00am at Rustom Baug and will be accompanied by an adult. There will be a bus organised to take the participants and volunteers to Om Creations where there will be workshops and demonstrations of the activities conducted at Om Creations. This will be followed by Lunch for all participants. The bus will then bring everyone back to Rustom Baug by 2:30pm and the parents can take the children home. 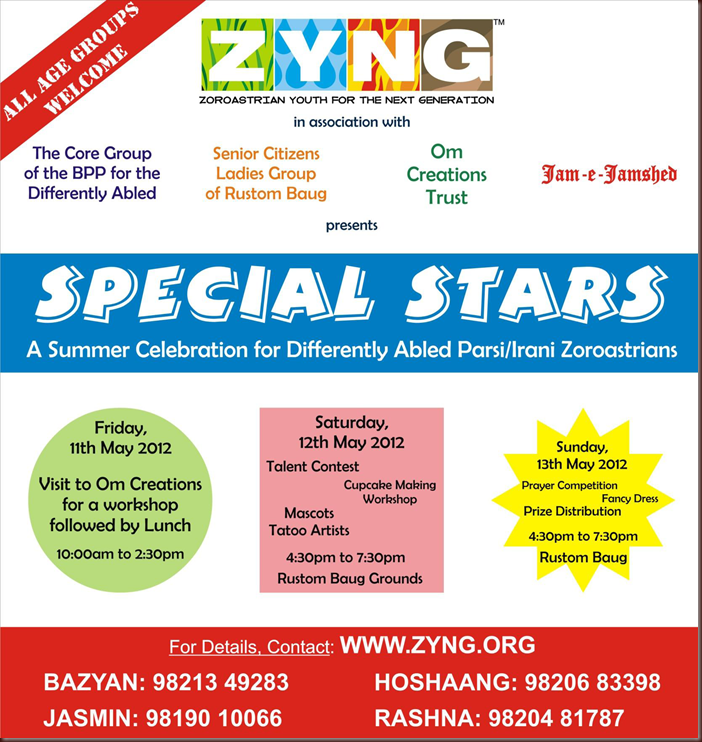 On Saturday, 12th May 2012, all participants will assemble at 4:30pm at Rustom Baug and will be accompanied by an adult. There will be a talent contest organised where both on-stage and off-stage talents can be showcased. All participants will be given snacks during the event. There will be a cupcake making workshop where the participants will decorate their cup cakes and can take them home. There will also be a DJ and mascots present to interact with the participants. Tattoos and Balloon animals will be given to the participants and there will also be popcorn and candy floss available. On Sunday, 13th May 2012, all participants will assemble at 4:30pm at Rustom Baug and will be accompanied by an adult. There will be a fancy dress competition and a prayer recital organised. All participants will be given snacks during the event. There will be a Prize Distribution where all the participants will receive a goodie-bag and special prizes will also be given to the winners of the various competitions. There will also be a DJ and mascots present to interact with the participants. Tattoos and Balloon animals will be given to the participants and there will also be popcorn and candy floss available. A horse carriage has also been arranged for the participants to enjoy. There is an OC Meeting organised on Sunday 6th May 2012 at 12:00pm at Rustom Baug to confirm all the requirements of the venue and the event. This meeting will help all to understand the way forward.